Eat. Live. Laugh. and sometimes shop! : Alex, please stay away! I do love living near the beach. I love walking my dogs along the bay. This, however, comes at a cost: the annual threat of hurricanes making entrance in the Sparkling City by the Sea any time from June through November. This, my friends, is a constant source of angst for those of us along the gulf coast. We have boarded up our windows and packed away every "irreplaceable" item in our house almost annually since moving to our coastal enclave. One year I even potty trained my kids in artificial darkness after we boarded up and then determined we did not need to evacuate. Nonetheless, we are not glib about hurricanes and the severity of the threat each and every time. 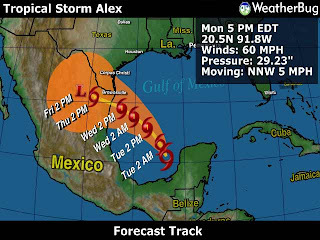 It now seems that Alex may have the Texas coast in his sight. 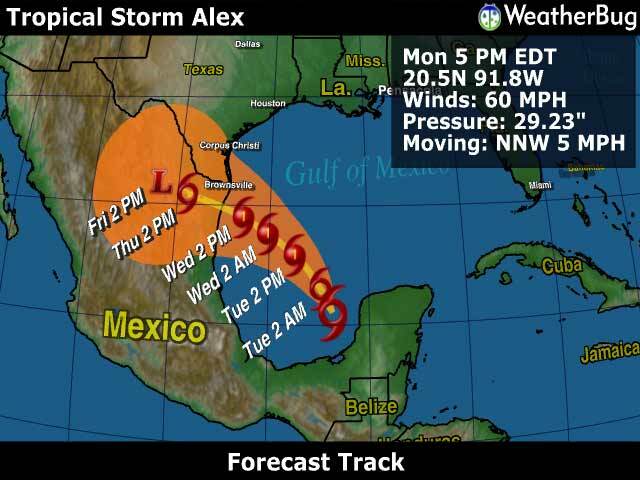 This puts it on high alert, despite the likelihood of him coming ashore in Mexico. We've all seen how these things can change at the last minute. With a tropical storm in the Gulf I become an avid weather watcher. A good friend who has moved to higher ground passed along the link for the Tropical Storm Risk website. I also like Weatherbug, which coincidentally has iPhone and iPad apps. I'll be refreshing my screen frequently over the next few days! That and praying for landfall in an unpopulated area far, far away from my home. My brother provided me with another great tracking site!